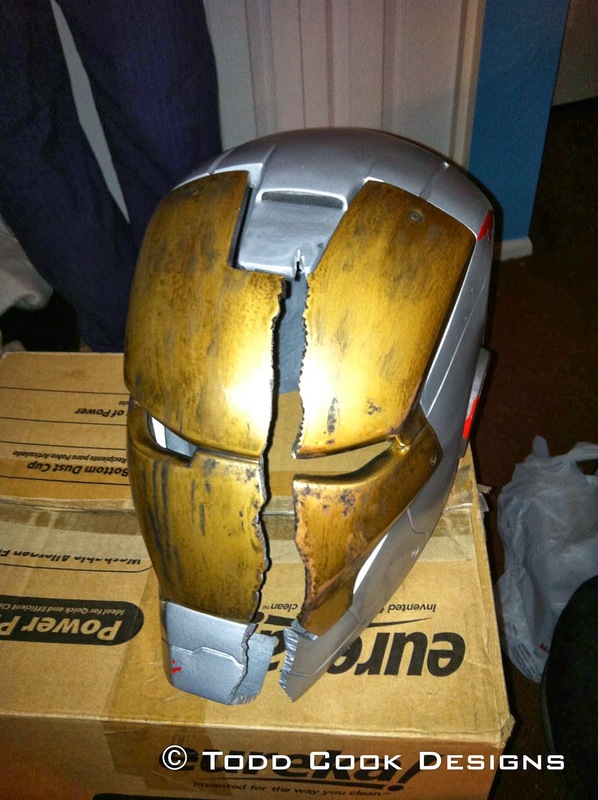 Years ago I had purchased an Iron Man mark 3 helmet off of the rpf from a member by the name of finhead. 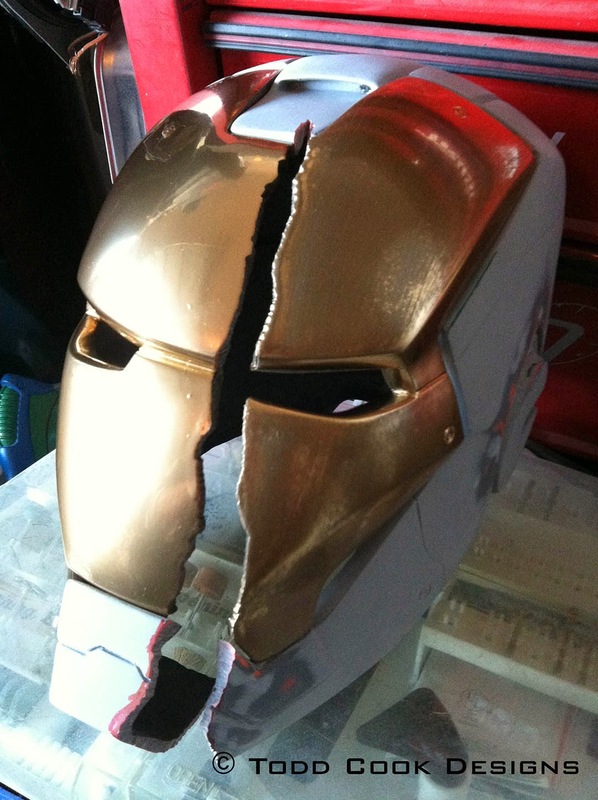 After it sitting in a box and collecting dust I thought it would be a cool idea to let my facebook fans decide how the helmet was to be finished. 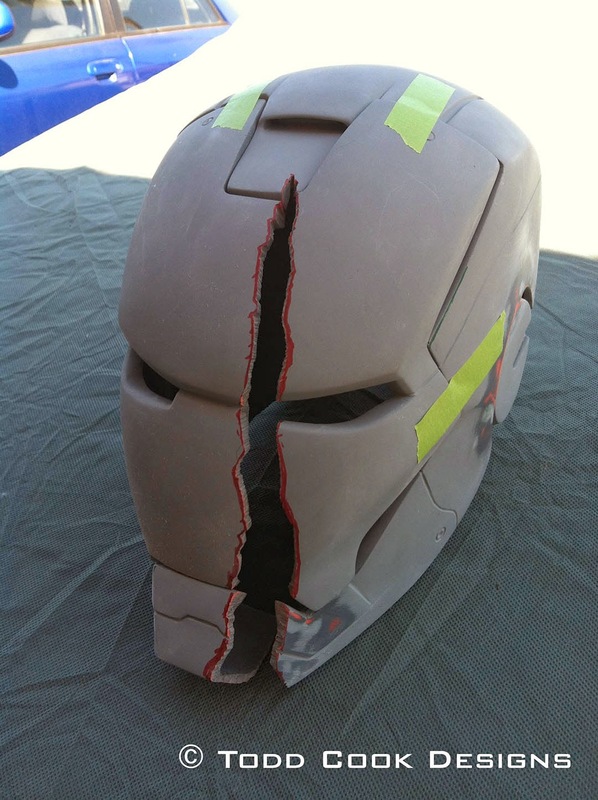 As it was about a month before Iron Man 3 was released and a few trailers were out that showed a very destroyed version of the helmet. I posted a poll to help me decide, either a clean unused version or the destroyed version from the trailer. Well as you might have guessed the destroyed version won. 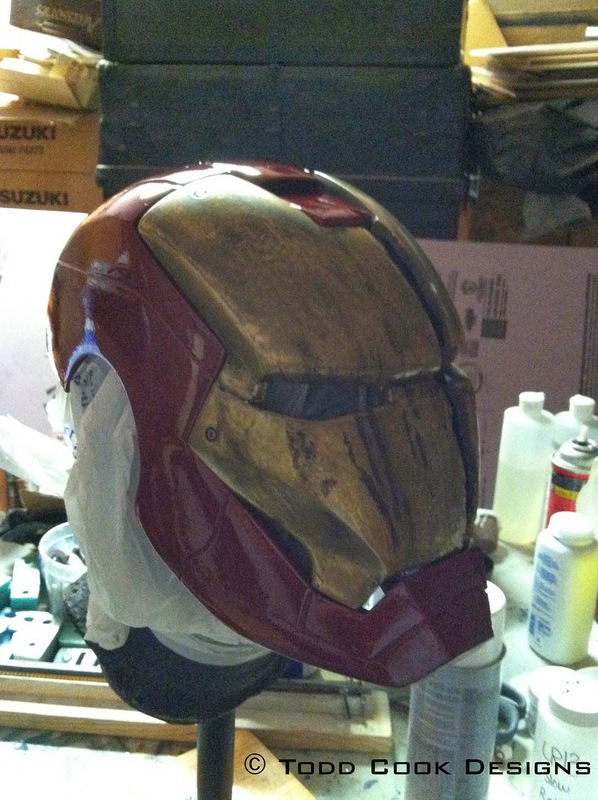 Since there is not a lot of build up here, as the helmet was already built, I will just go through the paint up process. 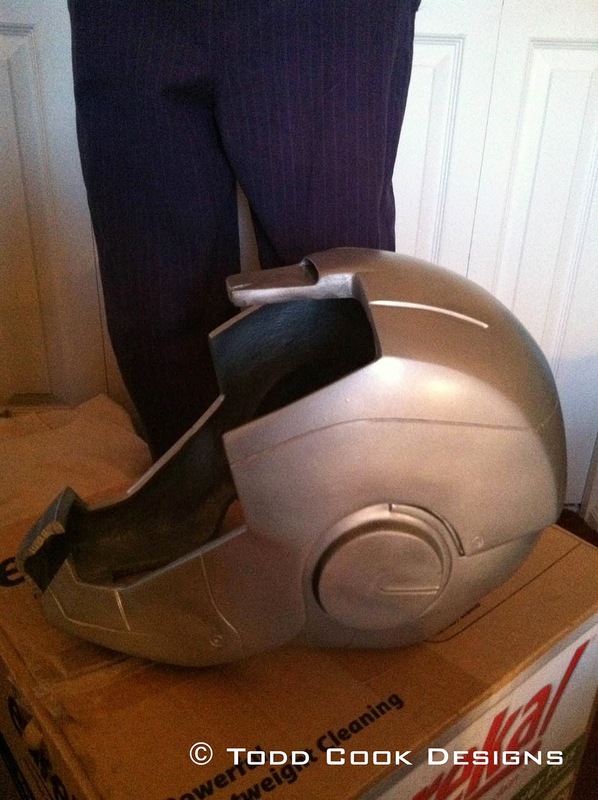 Actually before I could start the paint process I needed to cut the slit into the front of the helmet as seen in the movie. To do this I took a screen grab from the trailer and made an outline of the crack in Adobe Illustrator. 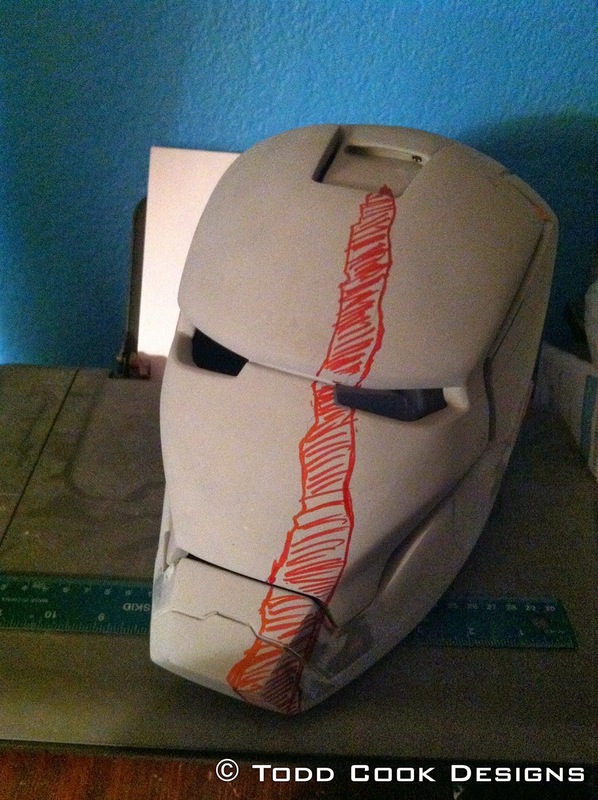 I then printed it out and traced the crack onto the helmet. Next step was to carefully cut out the section with a dremel tool. I made sure to keep the edges kind of rough as if it was really broken it would probably not be a clean break. Now on to the fun part... the paint up! 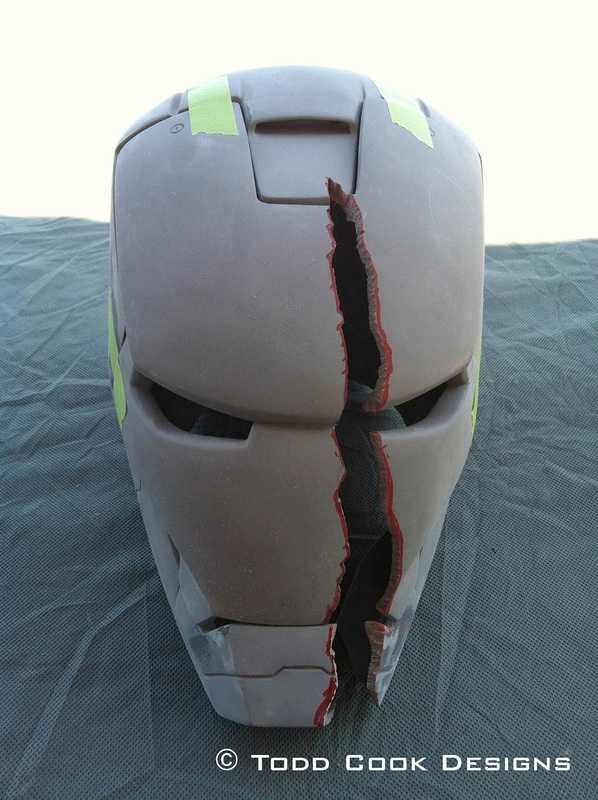 This paint job had to be done in several layers because it had to look scratched, chipped and really weathered. 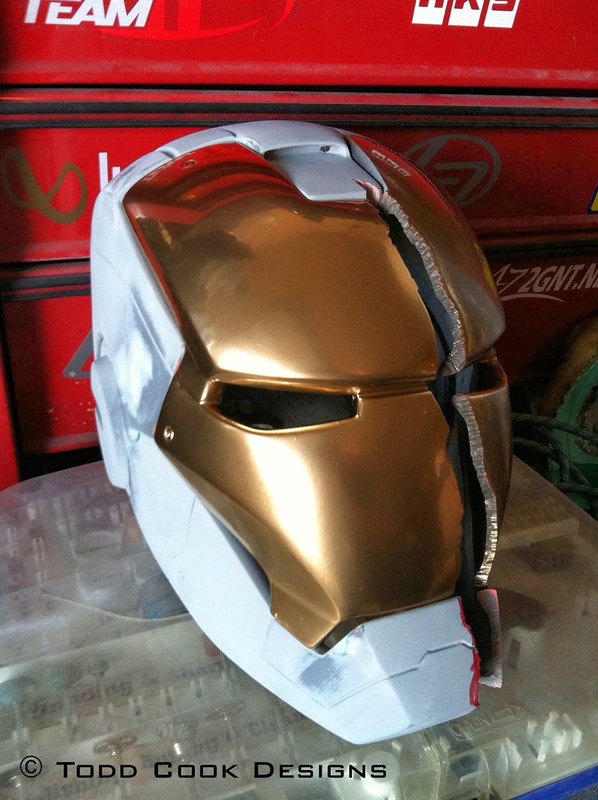 The first pieces I started painting were the 2 halves of the face plate. 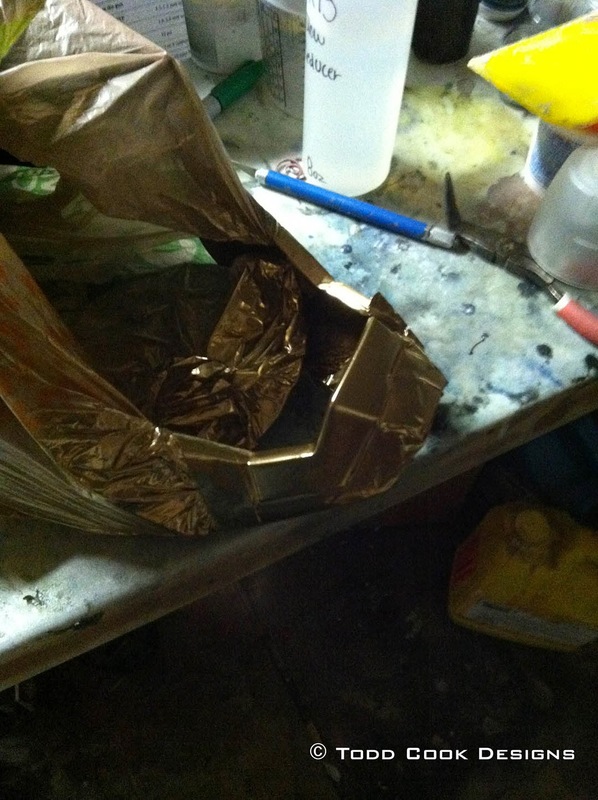 I used a spray paint called Montana Gold. They make all different kinds of colors, but of course I used shiny gold. At the time I had never used this type of paint, but always heard good things about it. As you can see from the photos I was very pleased with how it came out. 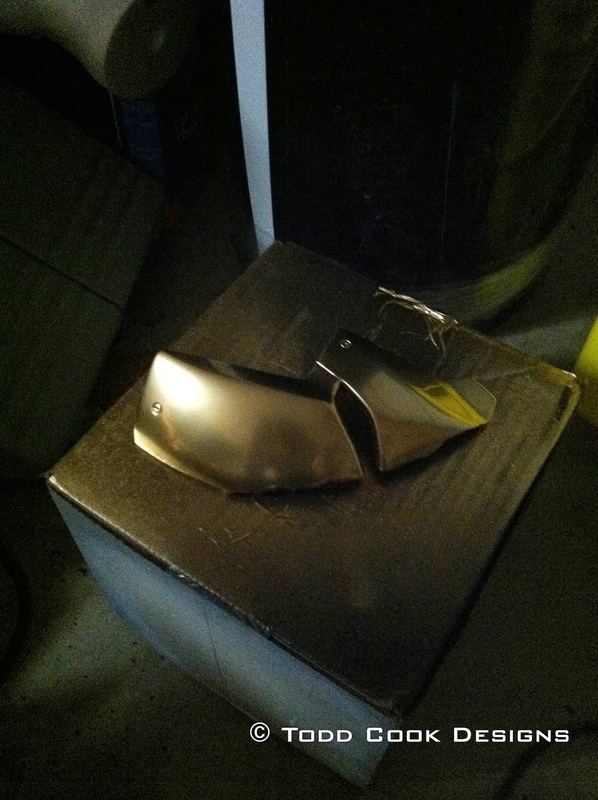 Unfortunately because I knew I was doing the destroyed version, I knew this paint couldn't stay shiny for long. I scuffed it up with a light sanding pad to take away some of the shine. 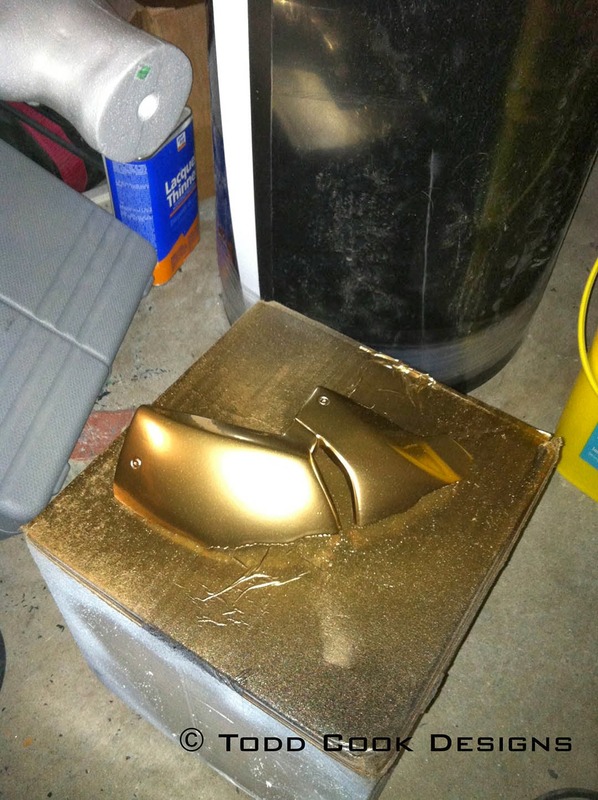 The top picture shows the shine of the untouched paint and the bottom shows the scuffed up side next to the shiny side. It still retains a bit of the shine, but not the way it was before. 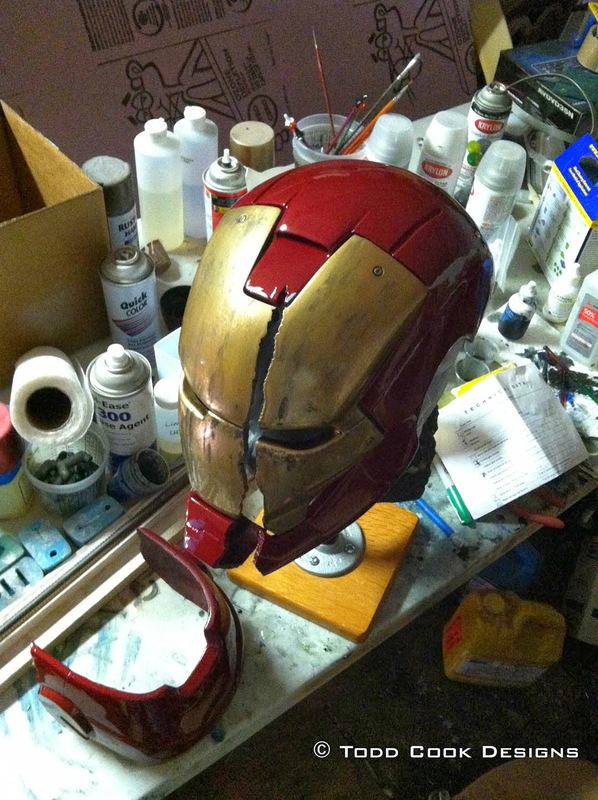 As for the rest of the helmet it needed a base coat of sliver so that all the scratches and chips would show through the red top coat. 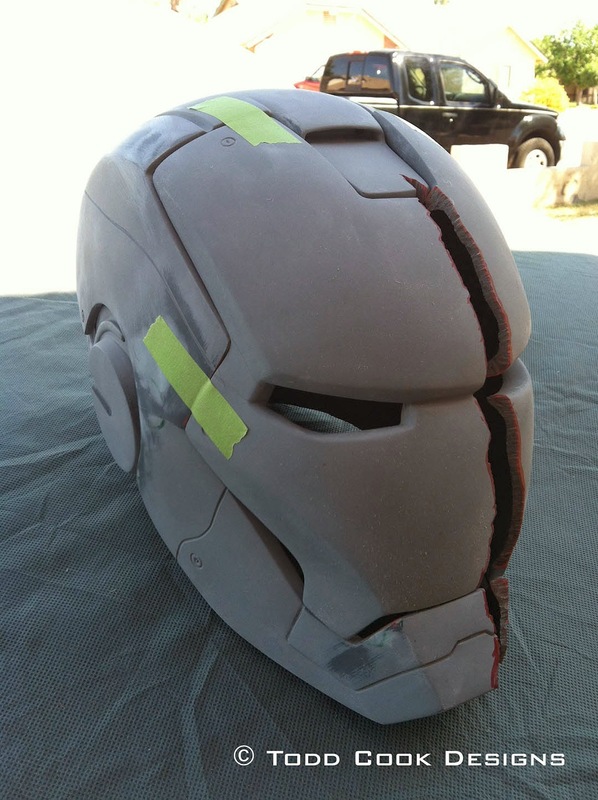 To make the paint look like it was chipped off I cut out shapes that matched parts from the movie trailer out of a vinyl sticker material and placed them on the helmet. Now it was time for the top coat of Pepper Red automotive paint. This was sprayed through an air gun to get the perfect finish. Once the Pepper Red had fully cured, I used an x-acto knife to carefully peal off the vinyl stickers. 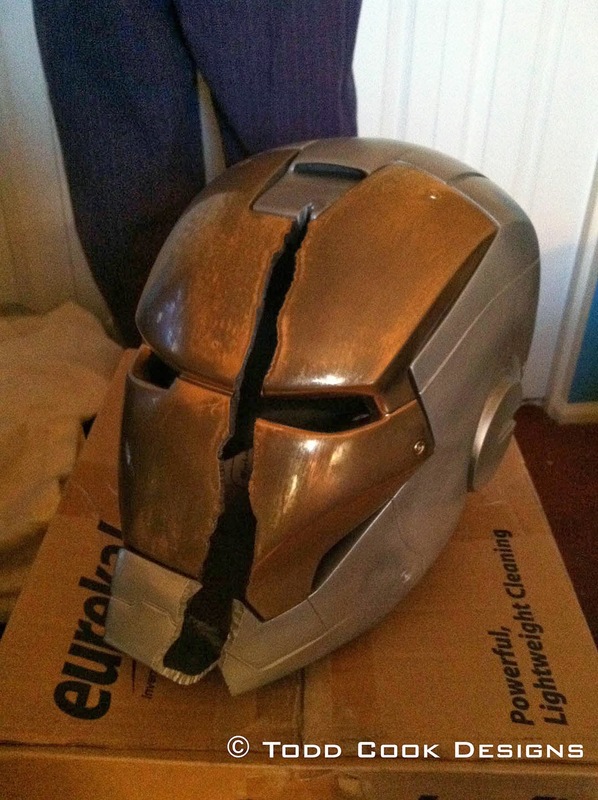 The next step was to tape off the chin so it could be painted to match the face plate. The final step was to add the scratches and burn marks. This was achieved by using acrylic paint with different shapes and styles of brushes. 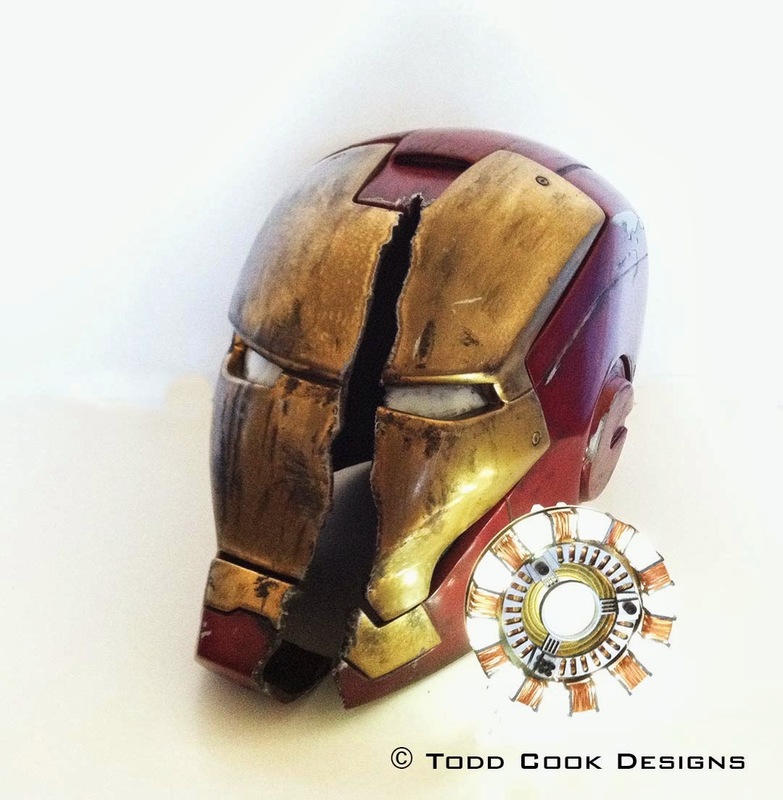 Here is the final version with the lenses placed in sitting next to my scratch built arc reactor. It has been a while since I posted any new updates, because I have been super busy. Many new projects have been created, but lets get into some projects that have been completed but not shown on here. 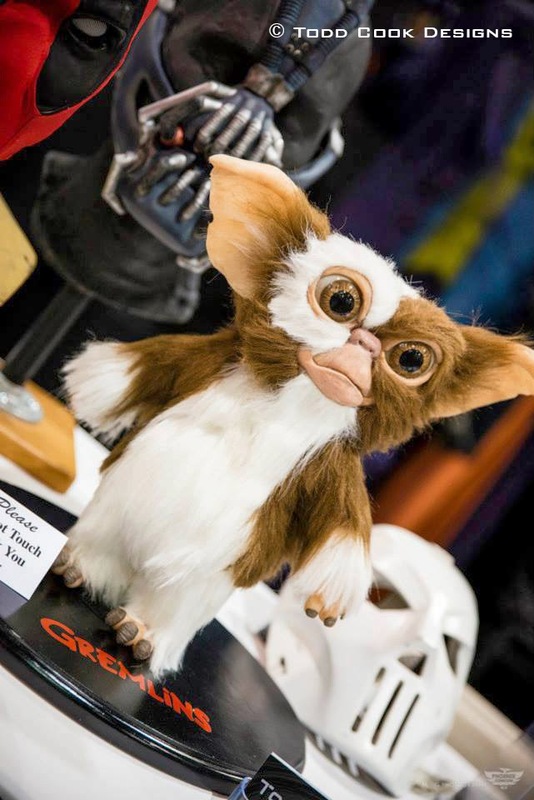 First up Gizmo from gremlins! 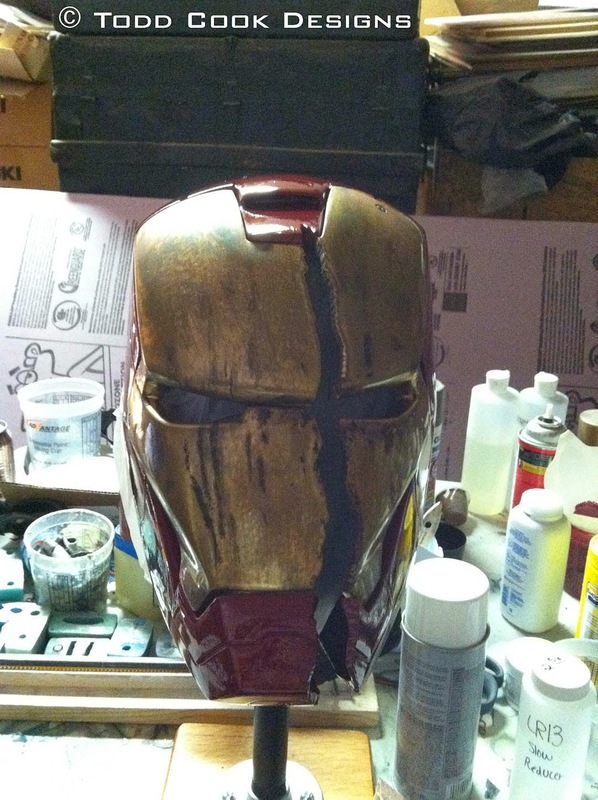 Last we left off I had all the pieces cast and the eyes airbrushed. Basically everything was ready to assemble, so lets get into it. 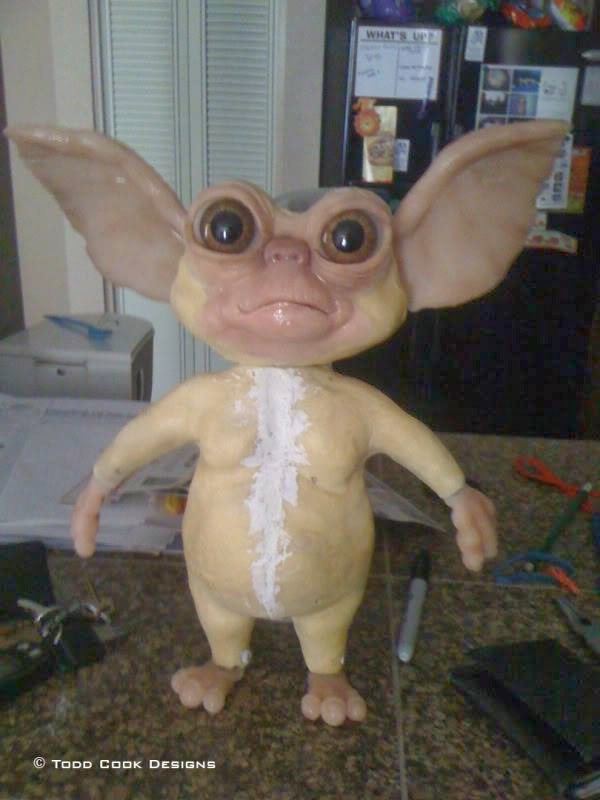 After completing my first gizmo (OG Gizmo) I decided that he seemed a little too skinny so I wanted to cut the body in half and make him a little wider. 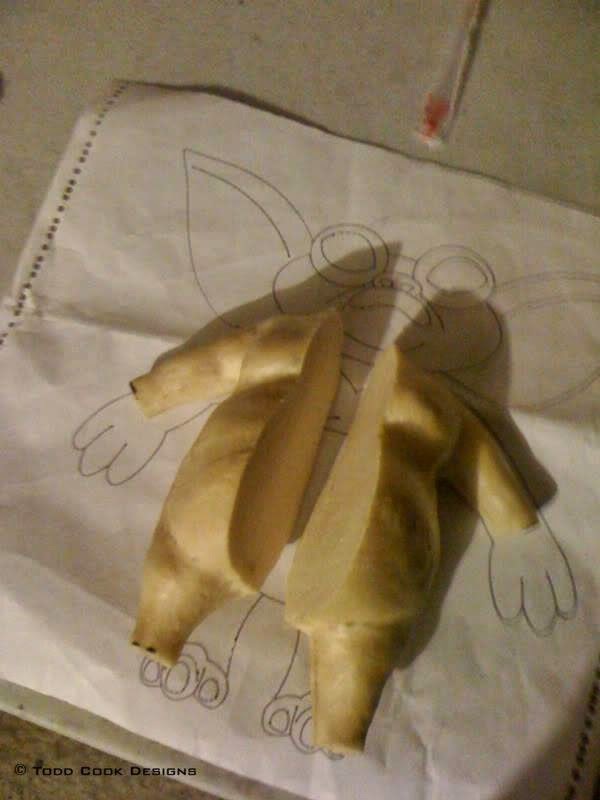 I sawed the urethane foam body in half and laid the 2 pieces on a blueprint of gizmo that I had used to sculpt him to size. From there I could figure out how much wider he needed to be. Once that was achieved I drilled a couple screws into him to hold the 2 halves together so I could glue the 2 pieces back together. As you can see from the picture that only the shoulders needed to be expanded out. 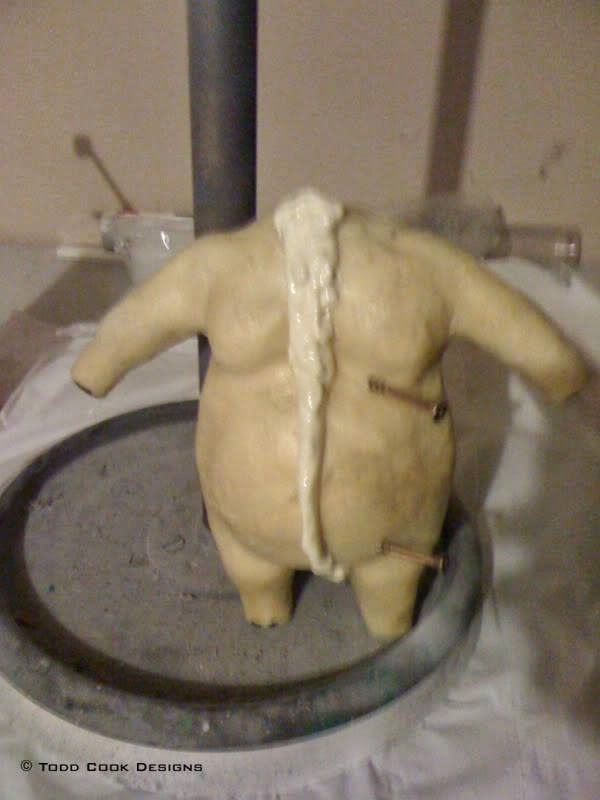 Since the body was cast in a urethane foam I used the spray foam in a can (the stuff used to seal crack and gaps in your house) to seam him back together. As soon as the foam completely dried I was able to carve back the shape of the body and add a little bit of filler to smooth out the section. Now it did not matter if the section was completely smooth as fur would be glued over the top anyways and you would never see where the seam was created. 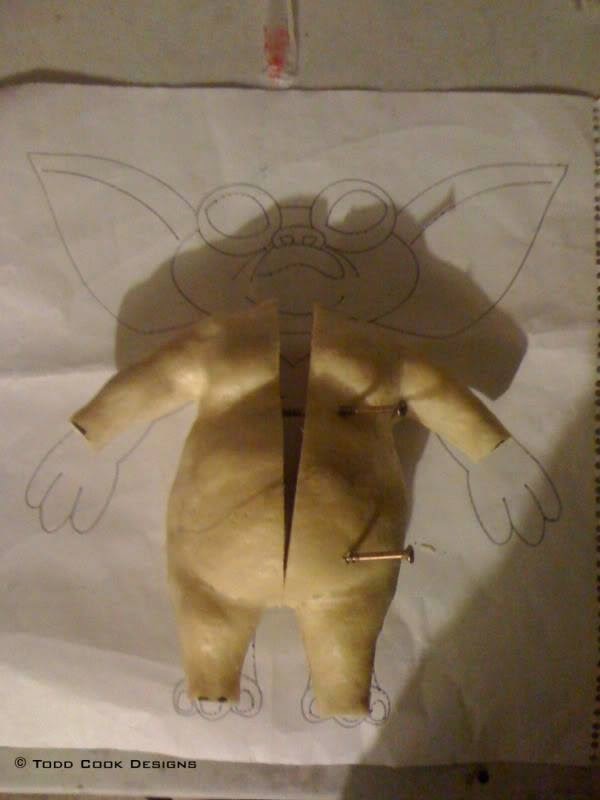 The picture below shows the finished seam along with the hands, feet, head and ears attached. 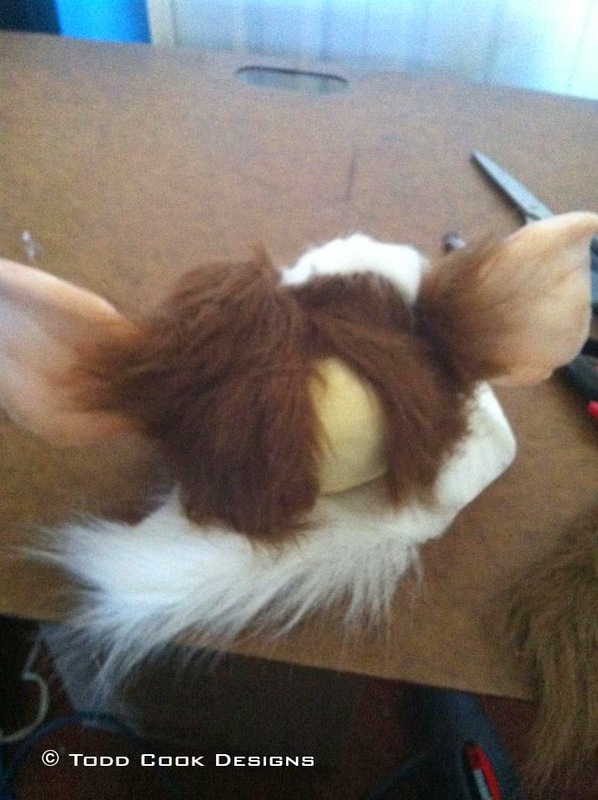 Now that the base of Gizmo was finished it was time to start the long process of applying the fur. 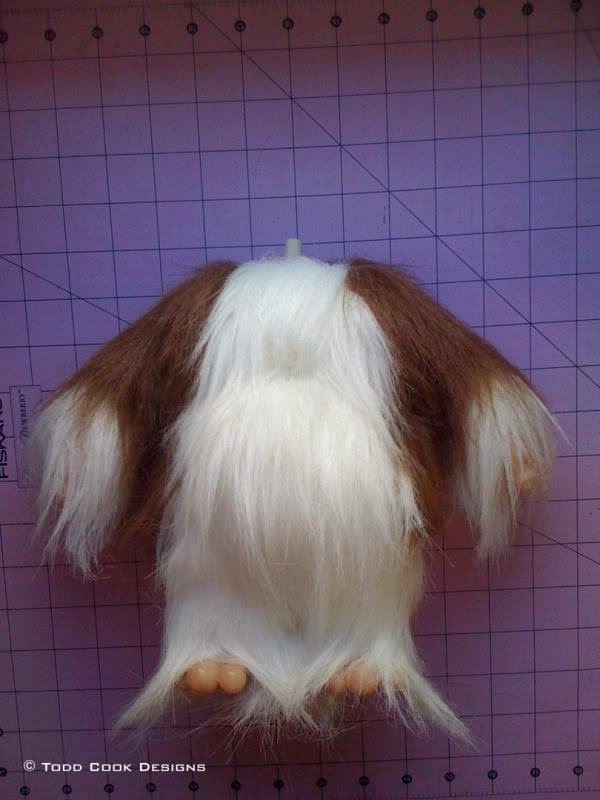 I had templates made from my first Gizmo that aided me in speeding up the fur process. Each piece was cut, trimmed and seamed very carefully into each other as to not see where they connected. The final step in assembling this Gizmo was adding his claws. Because his hands and feet are silicone I wanted him to have hard claws instead of silicone cast in claws. 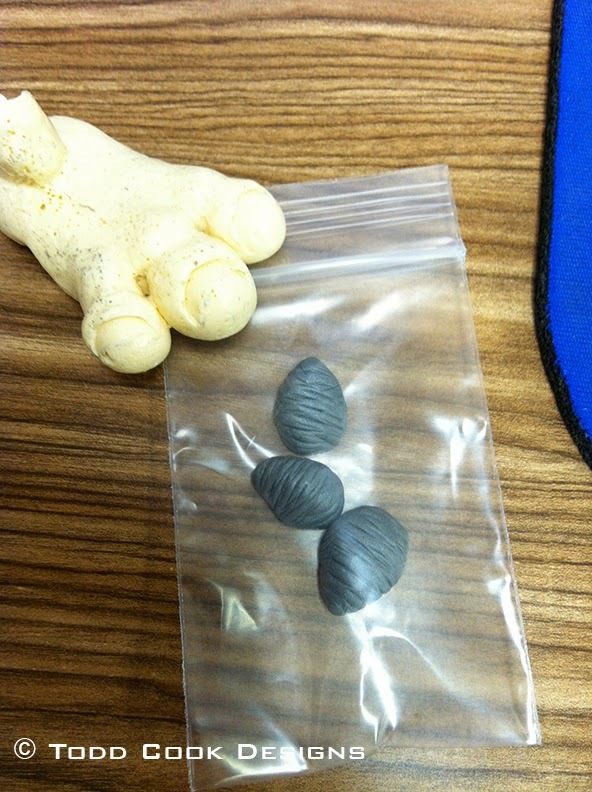 I ended up using plumbers putty to hand sculpt each individual claw. They were then super glued to the silicone and painted. 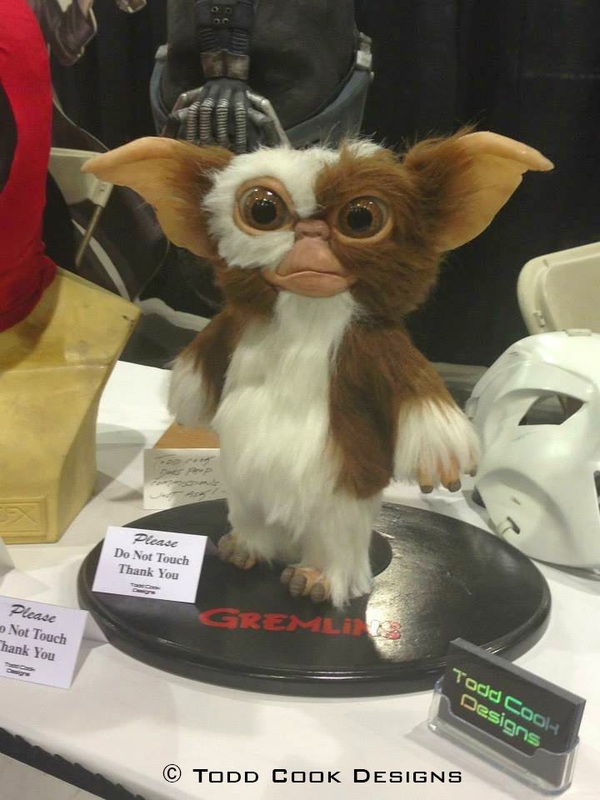 Once that was completed, Gizmo was finished. He was finished up right before Phoenix Comic Con 2013, so of course he was one display at my booth. Here are a couple photos to show the finished project.